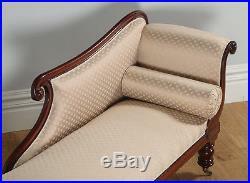 Antique English Regency Mahogany Upholstered Chaise Longue (Circa 1830). Here is a fine quality antique English Regency mahogany chaise longue, circa 1830, which has been newly upholstered, in good condition. Attractive upswept right-hand scroll arm. 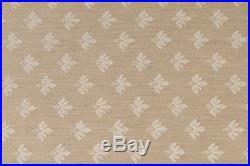 Taupe Fleur-de-lis cotton & silk brocade upholstery. 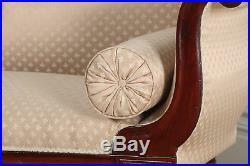 Sweeping shaped upholstered backrest. Carved shaped back rail and & arm. Stunning carved cabriole legs. Original polish & patination. 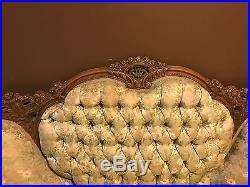 The chaise features (when facing) a left-hand raised sweeping upholstered arm. 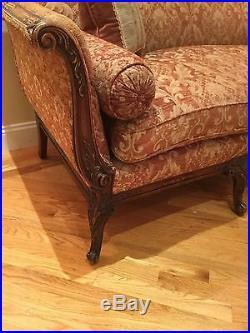 The carved moulded back frame, which is also upholstered, sweeps down to a scroll end, and terminates below on a sprung base, with a ruched and piped bolster cushion. The chaise boasts a sweeping moulded fascia to the splayed arm, with a moulding to the rest of the frieze. The arm and backrest are solid in joint. The chaise has been newly upholstered in top quality taupe colour fleur-de-lis pattern cotton & silk brocade upholstery and finished with matching piping. The stuff over seat has been professionally sprung and is in good condition. 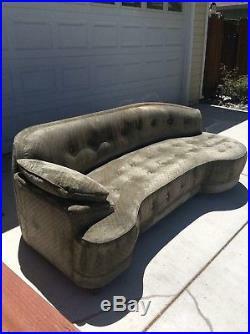 The seat is firm but comfortable to sit on; you do not sink into the chaise. 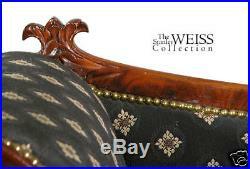 The underside of the chaise has been traditionally upholstered in hessian backing material. 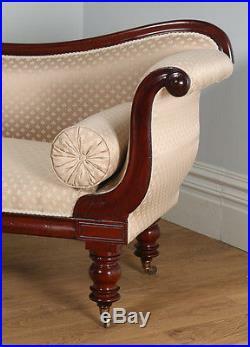 The chaise stands on quality solid mahogany baluster legs and retains its original brass cup castors. 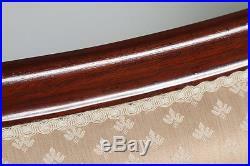 This chaise features a rich dark red brown mahogany colour and boasts a lovely colour and patination. 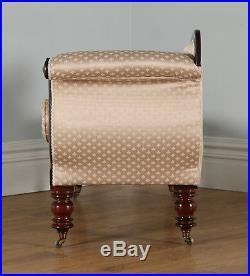 This item would look superb in a variety of rooms, especially the living room or bedroom. The item would certainly grace any home or office and is a great investment, as it is extremely functional. External height = 88.3cm or 34¾ or 2ft 10¾. External width = 179cm or 70½ or 5ft 10½. External depth = 63cm or 24¾ or 2ft 0¾. Seat height = 47cm or 18½ or 1ft 6½. Seat width = 151cm or 59½ or 4ft 11½. 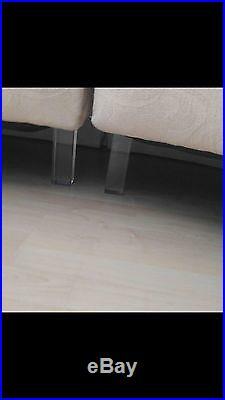 Seat depth (against upholstered back) = 51cm or 20 or 1ft 8. Seat depth (at foot end) = 60cm or 23 or 1ft 11. Arm Height = 81cm or 31 or 2ft 7. Back Height = 47.5cm or 18¾ or 1ft 6¾. 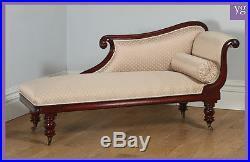 The chaise longue frame is in very good condition. 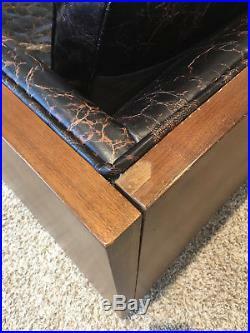 Nominal old use marks to the leading edges of the mahogany frame, but nothing significant considering the age of the item. 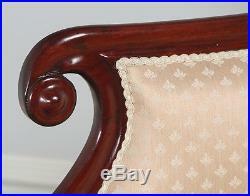 There are no missing carvings or mouldings to the frame. 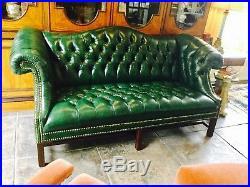 It is firm but comfortable to sit on; you do not sink into the chaise. 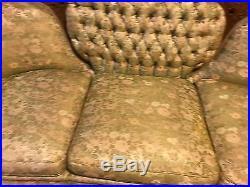 Therefore, the upholstery is in excellent and clean condition. 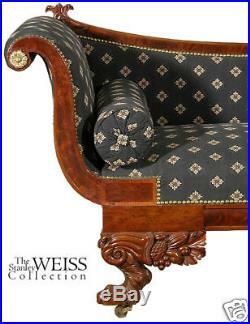 The chaise stands on its original mahogany baluster legs and retains its original brass cup castors. The chaise longue is well constructed, solid in joint and ready to use. Packaging removed & recycled. All items are professionally packaged and fully insured in transit, therefore, we can assure you, your items will be securely protected in transit and arrive safely with you. Before placing your order(s) please make sure this is the item for you. Delisting & Sale Cancellation. CINOA is the world association of Art & Antique dealer associations. All LAPADA & CINOA members abide by their strict code of practice by adhering to reputable standards of quality, expertise and integrity. Yolanda Gray has dealt in fine art and antique furniture for over 40 years. Yolanda Gray has a special interest in Colonial furniture, specifically Colonial Four Poster Beds. Yolanda Gray also provides a variety of fine English Antique Furniture, Art and Fabrics to clients in the UK, Europe and further afield. 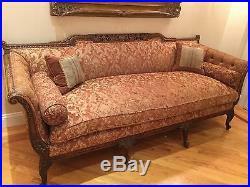 The item “Antique English Regency Mahogany Upholstered Chaise Longue Sofa Couch c. 1830″ is in sale since Friday, May 26, 2017. 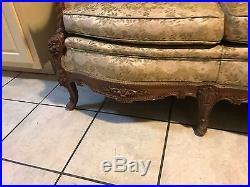 This item is in the category “Antiques\Antique Furniture\Sofas/Chaises\Pre-Victorian (Pre-1837)”. 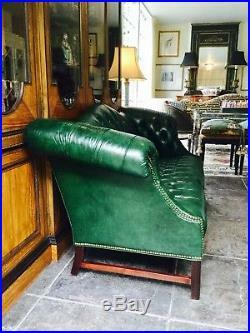 The seller is “yolandagrayantiques” and is located in Tarporley, Cheshire. This item can be shipped worldwide. 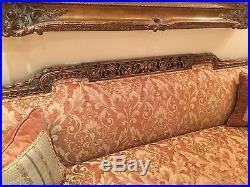 Incredibly comfortable yet so elegant beautiful French antique sofa, with intricate carvings & design. Comes with 2 bolster pillows & 2 throw pillows. Also has excellent down cushion for seating. Sturdy frame in a walnut wood with light & dark shading. A small tear in the seat upholstery. 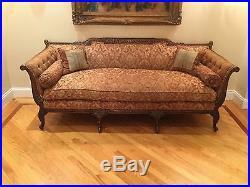 The item “Antique French sofa in walnut wood with beautiful carving details. Tufted sides” is in sale since Monday, August 28, 2017. 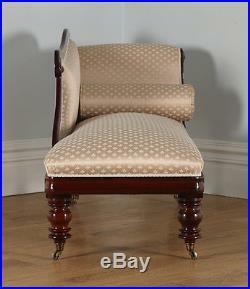 This item is in the category “Antiques\Furniture\Sofas & Chaises\1900-1950″. The seller is “gailstreasures1″ and is located in Brooklyn, New York. This item can’t be shipped, the buyer must pick up the item. 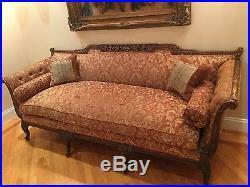 1890′s to early 1900′s sofa in great condition. 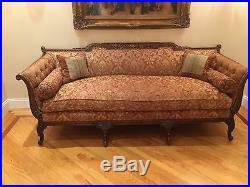 The item “1890′s to 1900′s victorian sofa couch” is in sale since Wednesday, August 30, 2017. 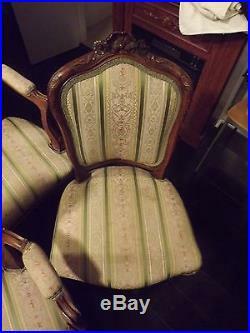 This item is in the category “Antiques\Furniture\Sofas & Chaises\1800-1899″. 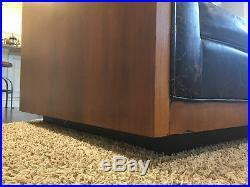 The seller is “marksilvers97″ and is located in Calhoun, Georgia. This item can be shipped to United States. 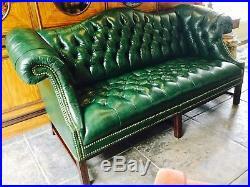 A handsome vintage green leather tufted Chippendale sofa trimmed in brass nailheads. 33″ x 27″ d. Condition: Preowned with age related wear consistent with age. No tears or holes. Or Rich Garvin with Garvin Transportation at. 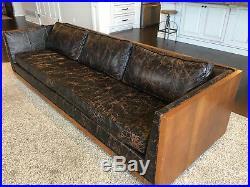 The item “Vintage leather sofa tufted Chippendale” is in sale since Friday, November 03, 2017. 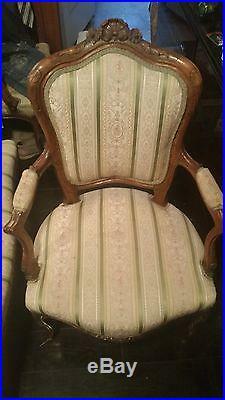 This item is in the category “Antiques\Furniture\Sofas & Chaises\Post-1950″. 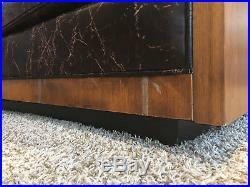 The seller is “pastperfect2tyler” and is located in Dallas, Texas. This item can’t be shipped, the buyer must pick up the item. 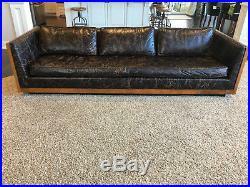 Vtg Mid Century Modern / Hollywood Regency Milo Baughman Sofa Amazing Vintage Sofa Milo Baughman Style Mid Century Modern Sofa Good Vintage Condition/ Newly Reupholstered In Leather / Some Wear To Wood Panels Beautiful Design With the Wood Paneled Sides And Back, One Cushion Seat Weathered Leather Upholstery Dimensions: 27.5H x 106L x 37 3/4D Stunning Designer Sofa For Any Space. 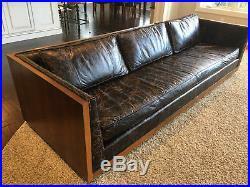 The item “Vtg Mid Century Modern / Milo Baughman Sofa- Restoration Hardware Style” is in sale since Monday, October 23, 2017. 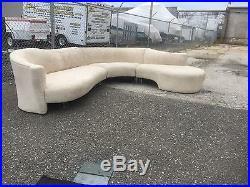 This item is in the category “Antiques\Furniture\Sofas & Chaises\Post-1950″. 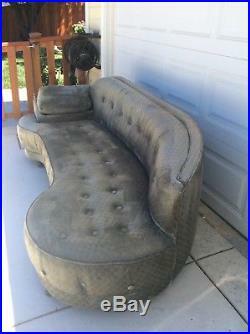 The seller is “graceandpiece” and is located in Byron Center, Michigan. This item can be shipped to United States. 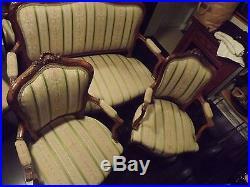 Victorian french parlor set. 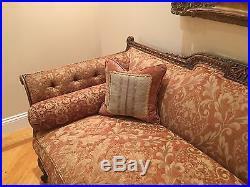 Love seat, 2 armchairs , 1 chair. 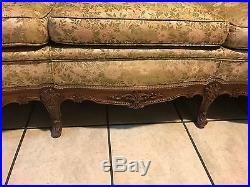 The item “Antique Victorian Carved Rococo Revival Parlour Set Sofa/Chairs/Marble Tables” is in sale since Saturday, August 05, 2017. 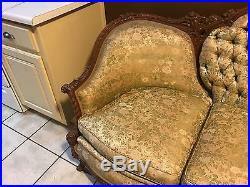 This item is in the category “Antiques\Furniture\Sofas & Chaises\1800-1899″. 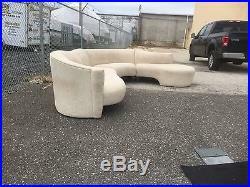 The seller is “realtywg_9″ and is located in Passaic, New Jersey. This item can’t be shipped, the buyer must pick up the item. The country’s largest collection of fine Classical & Colonial Furniture… Just steps from the RISD Museum & John Brown House. Tel (401) 272.3200. Tollfree (888) 884.5336. A Carved Mahogany Classical Recamier, Boston, c. This is a fine classical recamier with beautifully carved paw feet below a carved cornucopia of fruit. Note the deep carving, in the detailed images. This recamier has fine brass rosettes and is embellished with figured mahogany, that has turned an amber glow over the years. It is interesting to note the use of a satinwood banded panel above the bottom rail as an accent against the larger panel below. 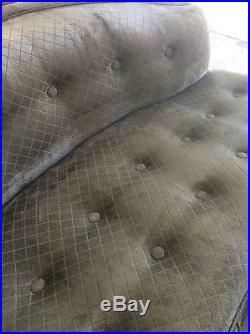 It is in a fine state of preservation with no breaks or alterations whatsoever, and we have reupholstered it with an appropriate fabric. Height: 32 1/2 in. All offerings are in fine condition with no major repairs or replacements unless otherwise indicated in description. Item must be insured in full. 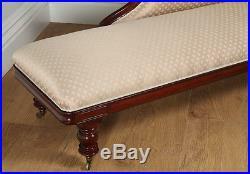 The item “SWC-Carved Mahogany Classical Recamier, Boston, c. 1830″ is in sale since Friday, November 06, 2009. 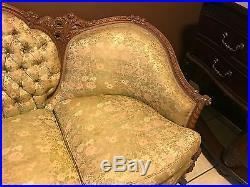 This item is in the category “Antiques\Furniture\Sofas & Chaises\1800-1899″. 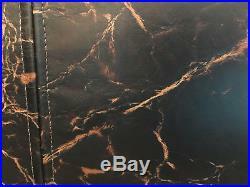 The seller is “stanleyweiss” and is located in Providence, Rhode Island. This item can be shipped to United States. 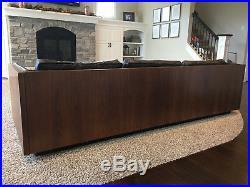 91″ long, 30″H Right side, 26 H left side. Sage green chenille fabric. 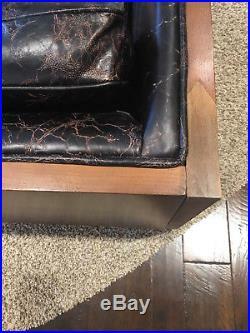 Reupholstered 5 years ago. Exellent condition with some minor wear on one small spot. Some fading on top rear portion, can be easily covered with throw or against a wall would not be seen. One or two lose buttons on bottom part but still attached, just a little lose. Seat and back cushion buttons fine. 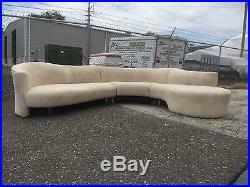 Seating is very comfortable and firm to medium. Has one lose pillow. If you have questions please ask. Very flexible on time period to pick it up. 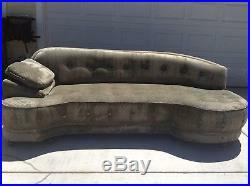 The item “1940′s Vintage Tufted 91 Chenille Curved sofa” is in sale since Saturday, November 11, 2017. 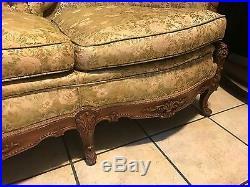 This item is in the category “Antiques\Furniture\Sofas & Chaises\Post-1950″. 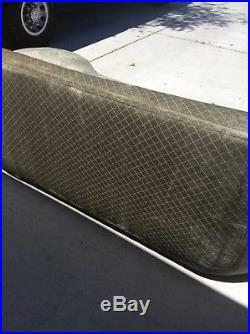 The seller is “rain3142″ and is located in West Sacramento, California. This item can’t be shipped, the buyer must pick up the item. 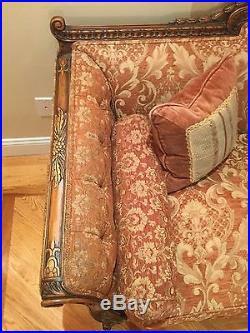 Condition-needs to be re-upholstered. Our shippers are just a suggestion, and they are responsible for the item once it leaves our possession. Message for quotes and information. 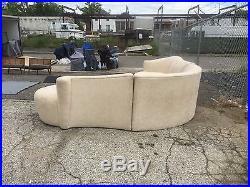 The item “Vladimir Kagan Sectional Sofa With Lucite Legs Cloud Mid Century Modern” is in sale since Sunday, April 30, 2017. 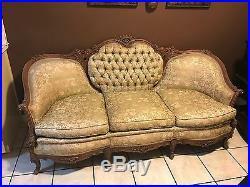 This item is in the category “Antiques\Furniture\Sofas & Chaises\Post-1950″. The seller is “mcmmatts” and is located in Holmes, Pennsylvania. This item can be shipped to United States.